10 Pack of Bento Box Style 3 Compartment Lunch Containers Just $12.99! Down From $26.95! You are here: Home / Great Deals / 10 Pack of Bento Box Style 3 Compartment Lunch Containers Just $12.99! Down From $26.95! 13 Deals has these 10 Pack of Bento Box Style 3 Compartment Lunch Containers on sale for $12.99 (Reg. $26.95) or 2 for $19.98 + FREE shipping! The containers are sectionally divided to store different foods in each compartment. The bento boxes come with an airtight plastic lid which prevents food from leaking out of the container. Its slim design makes it effortless to carry in your bag to school, work, or wherever.They are stackable so that you can easily store them. The lunch boxes are BPA free, dishwasher safe, freezer safe and microwave safe. They are designed with your convenience in mind! 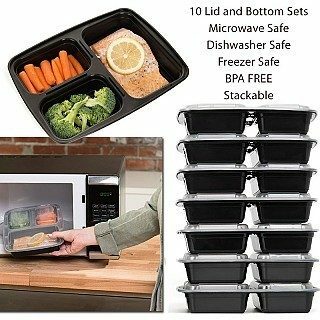 The containers arrive in a pack of 10, so even you accidentally leave behind a box, you have plenty more to take it’s place. Package measures 8.5″l x 6.5″w x 4.5″h.